What a gorgeous card I love your cute image and your colours are so warming, beautiful design love it.. it’s just starting to snow here..
A pretty card Sylvie, such a cute image. I love your beautiful collage of papers and elements and the beautifully coloured image! Such a pretty Springlike card Sylvia, especially as I'm sitting looking out at it snowing here in the UK. This is a very sweet card with a fabulous image. 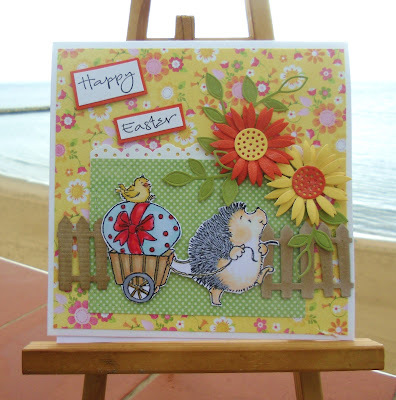 I love the little scene you have created with your picket fence!